I think fruits of the spirit depend upon the measure of the spirit we receive just like gifts of the spirit. Do all speak in tongues? do all receive discernment or dream, dreams? No! As far as works go do all do missionary work, feed and clothe the homeless? Do all do prison ministry or tend to the sick and dying? No again, but let's get back to basic Christianity 101 To those who receive much, much is expected but those who receive less, less is expected. I think works are a measure of spirituality and should be done willingly out of gratitude with thanks giving in our hearts. Nothing more nothing less. Do we ask questions at Bible study that some may be too embarrassed to ask? Do we show up early to make coffee or stay late to clean up or fold chairs? Do we donate GOOD clothes we would not be embarrassed to wear. Do we share from the heart out of love? I don't consider myself a qualified fruit inspector. Rather an ad hoc nut inspector, trying to determine the legitimate from the crazy. Love came to me immediately upon receiving the Holy Spirit but the rest took study, education, practice and work. I say 'I' a lot because regarding personal revelation I cannot speak for others. It's easy to say the sinners prayer but putting the talk to the walk is a different matter. Most authorities likely would think John the Baptist nuts but those who repented and got baptized got the message. Repent being the key word. Baptism of the Holy Spirit and having a true spiritual experience is far better than taking a bath and reading a book. It's undeniable and motivational. Ask the Lord for it. It changes lives and attitudes immediately. Good works will be the result. You will joyfully to do them and they will be a rewarding experience. Can a person go to heaven without loving God? write what you see, when was that understand, what is written. Did you just sit down and start typing words randomly off top of your head??? What are you taking about??? Its like: We're playing football and you are on the baseball field hollaring I made a touchdown! My question was simple ( again I will tpye slow). Can a person go to heaven without loving God? How hard those must work who believe the salvation given to them by God almighty through the ultimate sacrifice of His Son Jesus Christ can be lost. What security do they have? None. All i did was quote what the apostle john said, so i guess the apostle john is nonsensicle also? Those where his words not mine, so your little attack of me is back on you, because you attacked the bible not me. Your ignoring and refusing to see pauls own words in 1 cor, which proves your interpretation in error, and 1 john that said whoever lives in sin has never seen god or known him. I use scripture to form my belief, i do not use my belief to inform my interpretation. So i will give you a chance to go finf us the post where you responded or ask forgiveness for once again bearing false witness. Your pride and areogance is showing again, your not all that, all you have to do is answer, these little comments do nothing but make you act like a spoiled brat, or someone who thinks their stuff does not stink, which one are you? Your accusation I am trying to make a doctrine out of one passage is ludicrous. Paul is writing to believers, and warning them of behaviour that would bar them from the kingdom of Heaven, as anyone with little discernment would know, apparantly, you, in your effort to stay with your false beliefs refuse to see what a child could see. People make a commitment to Christ, they receive the good news with joy. It is wonderful for them to have a saviour from sin, and they have had to do nothing to earn or deserve their salvation. But they made a shallow commitment, they did not count the cost of what following Jesus is(Luke ch14) Some change takes place in them(unlike the previous scenario), but when hardships or trials come along, their initial enthusiasm starts to wane, for they did not count the cost of discipleship. They can start drifting back into bad habits. And Paul, who obviously knew some in the Thesasalonian church could be as described warned them of the consequences of behaviour that would bar them from the kingdom of Heaven. Two different scenarios concerning 1John3:9&Gal5:19-21 But as you are having to go to ridiculous lengths to try and justify your errant beliefs continued discussion here is pointless. of course the Holy Sprit gives us the Fruits of the Sprit. but, do you manifest all of them all the time? no, you don't, I don't, no one does. now, you see, here is what you are trying to do- make up a formula that says how long it takes for one to manifest these fruits. because you want to judge. you think you are fruit inspector. and. you are not saying those words, it' s the hammering of " how long , how long?" that is how a legalist mind works- focusing on others and putting them under a formula, so you can judge them, which you have no right or authority to do so. Personal attacks and strawman arguments. I'm asking a simple question. DO YOU AGREE WITH POST 596 of "God Lied" or not? A simple yes or no, or don't bother to reply. You're the one who jumped in when you don't even know what the discussion is about, so Just answer yes or no to the bolded question above, since you are so eager to defend what Dcontroversial said. Am I the only one who gets the understanding from these verses also that SOMETIMES it might be hard to SPOT between WHEAT and TARE? Because why else would Jesus say that you may uproot the wheat with the tares if you go pluckin out the tares? Hi Hevosmies, I just posted this verse about judging others and that God will judge the wheat from the tares. 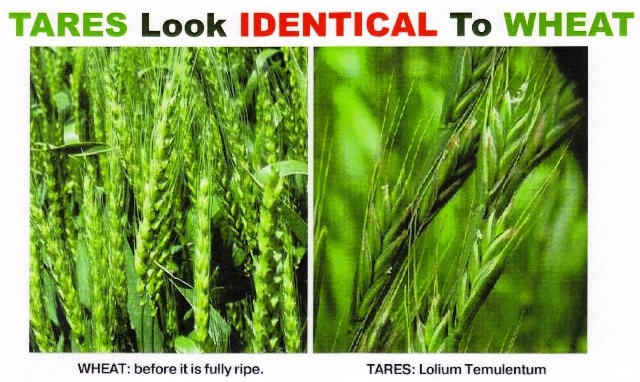 It is difficult to spot wheat and tares as you can see there are similarities for sure. On the other hand as VCO pointed out that the guy who is a tare sitting next to us at Church he also needs God's love and salvation and I agree. In another post you wrote that you were sad, what happened to cause your sadness are you doing okay? No worries and thank you. I didn't take it personally. I don't believe salvation can be simply lost like a set of keys or through carelessness and I can only speak for myself. I'm not trying to defend any doctrine. But I think it can be discarded or abused thinking like one can commit grievous sins then use salvation like a trump card to stay out of hell. God isn't stupid he can see right through the charade and what he does about it is up to him. That's all. Decades ago, I chatted to someone once, and told them I feared I may lose my salvation. They told me, the fact I thought like that proved I had not lost it. A baby does not love his or her parents, they depend on them to supply their needs, love does not happen until the baby grows. Ps, sorry if you were called an idiot, that kind of stuff should not be. That was nice to read. I hope you do not mind me saying this. It may be good to check with your minister anything people tell you on this website. I doubt there are many bona fide ministers on it. Did anybody else notice that you did not even attempt to answer the question. Who is he who ovwrcomes the world? He who does many works? He who keeps himself from sin? He who does not do certain sins? Even though he commits others? As for sadness many things feel like are piling up, loss of a loved one, physical ailments (and no money to fix em), and financial trouble ever since the government decided to change the rental system where now they can gauge you over 900euros for a ONE BEDROOM apartment! I know its petty, I dont know why i wrote that, i was in an emotional state, SORRY, i should THANK GOD that i can WALK and TALK. Maybe CS1 can remove that post if he deems it wrong! The only thing that will cause god to blot a persons name is to die in unbelief. Which means that person remained in a condemned state.